Palmetto Park Apartments is convenient to shopping, dining, and many downtown attractions. Nestled between local parks, beaches, and the Greenwood Recreation Center, we offer a tranquil escape from the daily grind. 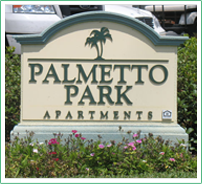 Call us today at 866-811-3432 and find out why you should make Palmetto Park Apartments your next home. Copyright © 2009 - 2019 Palmetto Park Apartments. All Rights Reserved.